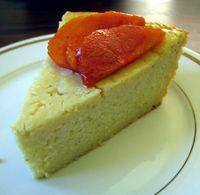 Quesada Asturiana - Cheesecake from Asturias. Lisa Sierra (c) 2010 Licensed to About.com Inc. The northern Spanish region of Asturias produces wonderful cheeses. This traditional cheesecake recipe is made with fresh goat cheese, for which ricotta cheese may be substituted. Quick and easy to prepare in a single bowl, this cheese cake is baked for approximately 30 minutes. Decorate with fresh fruit or powdered sugar and serve after dinner or for brunch. It's a great make-ahead dessert. Allow butter to warm to room temperature to soften. Grate the lemon peel onto a plate and set aside. Grease bottom and sides of a round glass baking dish (9.5 inches or 24 cm). Put requeson (or ricotta cheese) with sugar in a large bowl and mix thoroughly. Add eggs and softened butter and beat with an electric hand mixer. Add lemon zest, cinnamon and brandy and continue to beat with the electric hand mixer. While beating, gradually add in the flour. Continue beating until batter begins to thicken. Bake in the oven for approximately 30 minutes, or until the quesada turns a golden color on edges and the center does not jiggle. Remove and allow to cool before serving. Decorate by sprinkling powdered sugar or fresh fruit on top.